I got a very interesting paper about Skin Permeability. They build the model to predict permeability constant Kp(cm/h) with artificial neural network. Some of the chemicals are not so familiar, so I show the structures below. 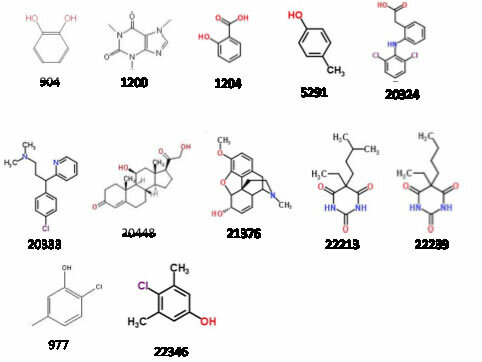 The functional groups diversity is very wide, and molecular size is also very different as you see. In the paper, they use the Abraham Descriptors, R2(excess molar refraction), π2 H(dipolarity/polarizability), Σα2 H, Σβ2 H (the overall or effective hydrogen-bond acidity and basicity), and Vx (the McGowan characteristic volume) to build their model. Let’s build the model with Hansen Solubility Parameters (HSP). From HCode (Hansen Code), you can search molecules from HSPiP DB. Or you need to search smiles molecular structures and calculate with YMB function. And input log(Kp) at the column of score. Then select GA option to search real data Sphere. 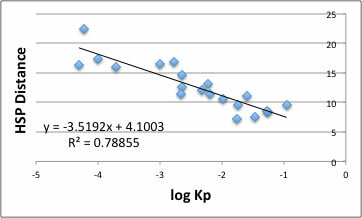 The correlation between HSP distance and log(Kp) is fairly good. The shorter HSP distance means higher Permeability through skin. For this correlation, you need only HSP of molecule. Molecular size is not needed. 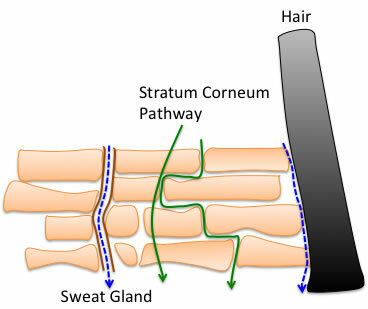 The HSP of skin become [17.12, 3.03, 13.89]. If you are using HTML5 enable browser such as Chrome or Safari,FireFox (IE9 have problems), you will see this Sphere. If you pick solvent, solvent name will appear. Using logKow is very popular to build these model. 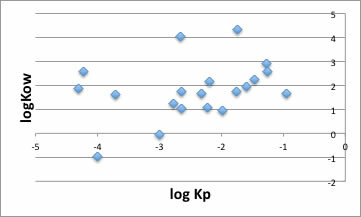 But when plot logKow to log(Kp), we can not find the tendency. I showed the molecular size effect at below chart. As you see, if the molecular size become larger, the log(Kp) become smaller. 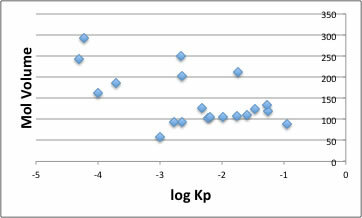 But mol volume around 100 compounds, size and log(Kp) have no tendency. Compare to these descriptors, HSP can handle this phenomena very clearly. "the likes dissolve likes". When we use the word "likes" we mean the HSP vectors [dD, dP, dH] likeness. The similar vectors dissolve similar solute vectors. Then which other descriptors affect to skin permeability? The function of Y-MB implemented in HSPiP produce many descriptors, and using these descriptors I made QSAR scheme. 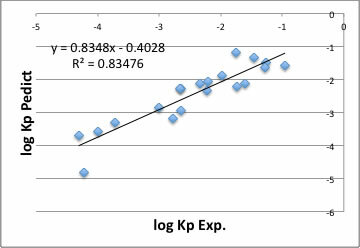 QSAQ method have no physical meaning, but it is convenient method to find other descriptors to affect log(Kp). I run the valuable select multiple regression program and determine important descriptors. The most important descriptor is HSP distance and second is solubility to water. The determination factor (R^2) become 0.83476. Why QSAR program did not select molecular volume? 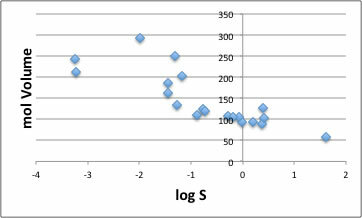 Molecular volume and log(Solubility to water) have the high correlation as shown below figure. It can be said logS parameter include both size effect and affinity to water. Then logS do what ? I found very interesting chart about skin permeability. HSP distance may account for Green line. LogS may account for blue dot line. HSPiP user send me other papers about skin permeability, so I will continue to examine more detail.